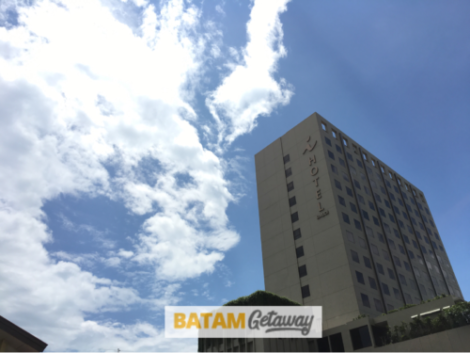 I Hotel Baloi Batam is one of the newest Batam hotels on the island. 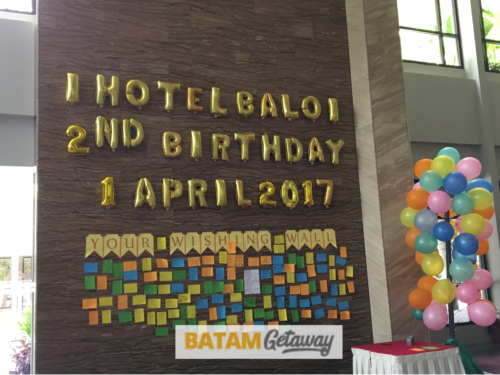 As of April 2017, this hotel is exactly 2 years old. From the exterior, it’s really hard to tell what this hotel is all about. 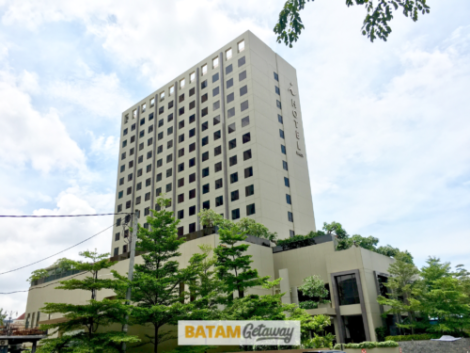 Like many other contemporary city hotels, I Hotel Baloi Batam adopts a simple and straight-forward design. Even its name is just a simple ‘i’. Nevertheless, looks can be deceiving; simple does not mean deficient. 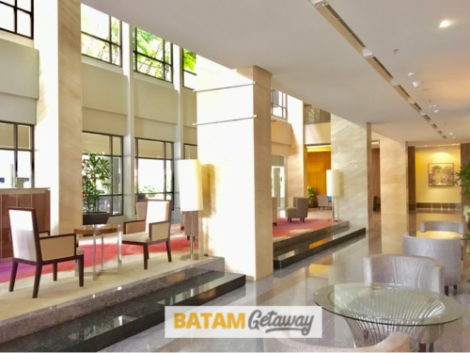 When you step into the lobby of I Hotel Baloi Batam, it radiates an atmosphere of simplicity and minimalism. There’s nothing flattering or excessive about the lobby; no over-the-top chandelier, no carpet, no big statues. Our team really like this ‘unpretentious’ feel. The real surprise starts when you reach your room level. The corridor feels refined; carpet, design, and all. At this point, you should be wondering “Alright, this looks promising, what’s next?!”. Once you enter the room, you’d feel like you’re in a different world. All their rooms (Superior, Deluxe, and Suite) radiate an assured sense of elegance and style. 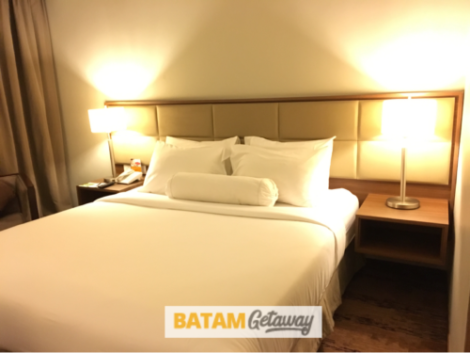 In terms of size, the rooms are reasonably sized, furnished with a comfortable mattress, pillows, and day chair / bed. Their chosen colours of silver, gold, and brown make everything look very classy. The carpet also gives an added feel of luxury and comfort. 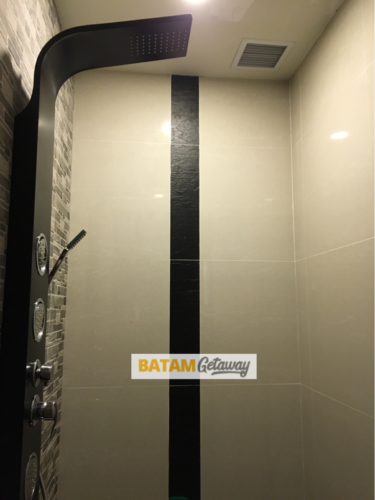 Lamps, lightings, and abstract paintings in the room and toilet have are tastefully enhancing the ambiance. 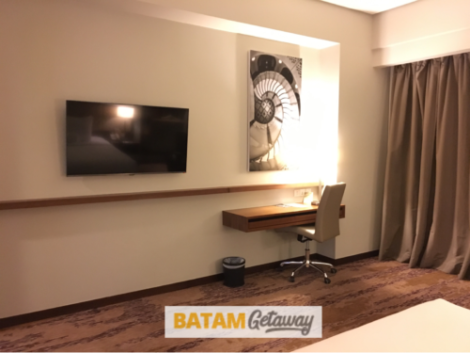 In addition, there’s a large enough flat screen tv with cable tv channels, safe deposit box, mini fridge, cups and kettle, working desk & chair, and a leisure couch (deluxe room) / day chair (superior) to complete the room. 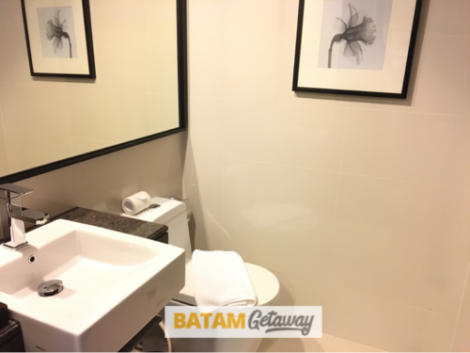 Apart from a bath tub, the toilet provides almost everything: hair dryer, toiletries, and ample space to relieve and refresh ourselves. After going through every single item and corner of your room, by now you should be relieved that you have got more than what you have paid for. 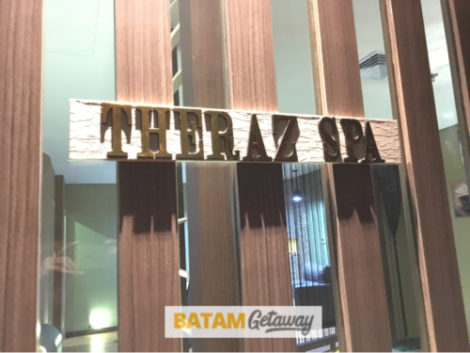 We were pleasantly surprised the moment we entered I Hotel Baloi’s Theraz Spa. 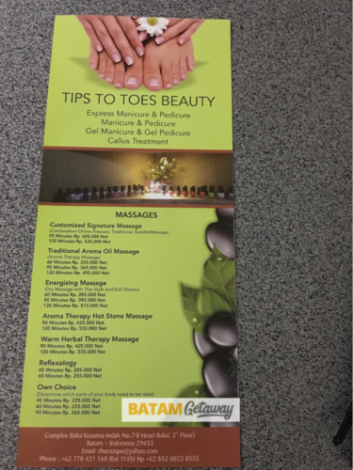 The whole place looks really fresh, new, and professional. 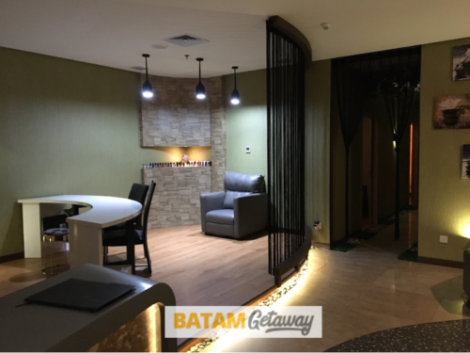 They have a substantial number of single and couple rooms within the compound. 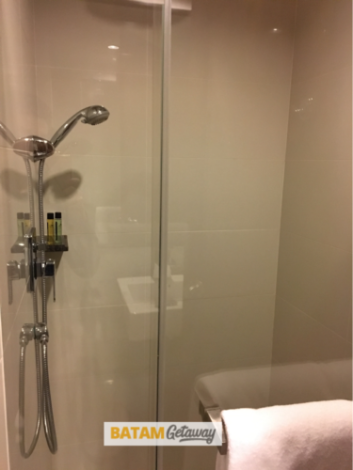 All rooms, single and couple, come with an en-suite bathroom, giving it a touch of privacy and exclusivity. 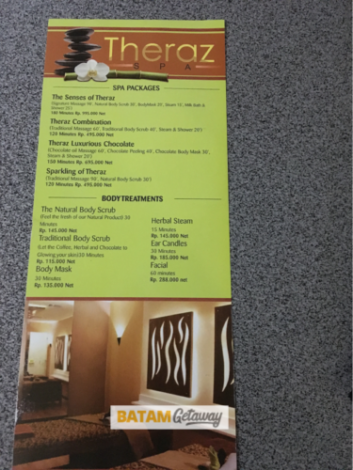 With such comprehensive amenities and choice of service, this spa centre is definitely up to standard and comparable to the numerous spa centres all over the island. 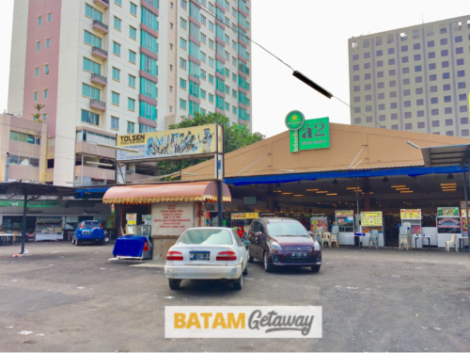 Breakfast is crucial for all leisure and business travellers. 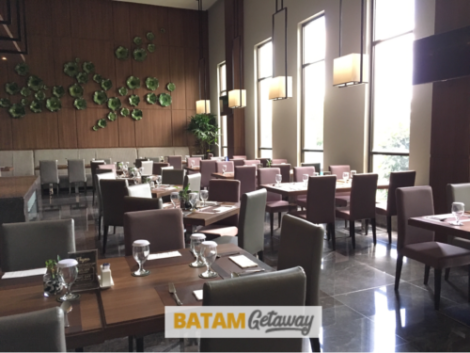 Hence, a breakfast hall that’s tastefully designed with a high ceiling and stylish equipment will make a simple breakfast activity that much more enjoyable. 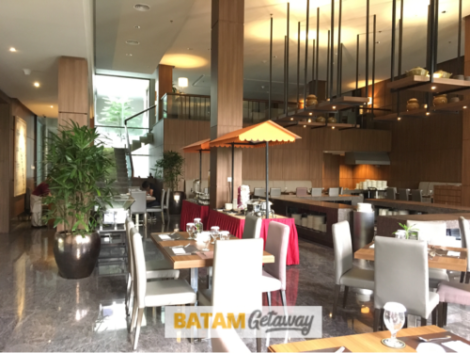 I Hotel Baloi is strategically located in the Baloi / Penuin area, second only to the main Nagoya area. 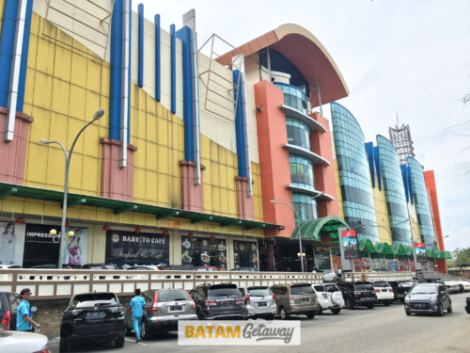 It’s literally right next to the popular Batam City Square (BCS) Mall, A2 Food court, and rows of shop houses which offer various services such as massages, restaurants, and more. Nothing fancy about the hotels’ rooftop pool, just a standard rectangular swimming pool. You can use it for the usual laps or just to soak up the cool water while bathing under the sun. 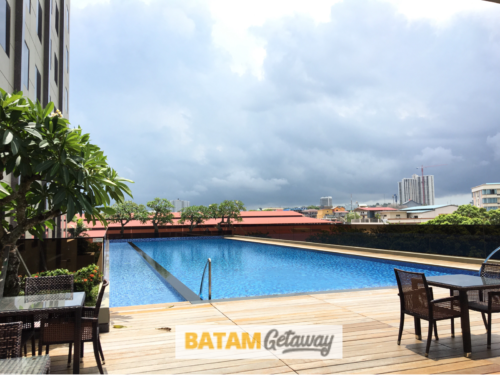 One advantage of having a rooftop swimming pool is that little extra scenery surrounding it. There are instances in life where it’s not about the size but what you can do with it that matters. 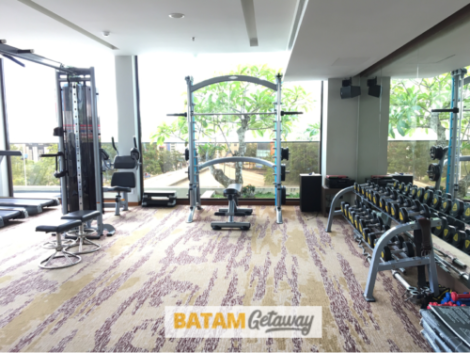 This is exactly what I Hotel Baloi Gym represents. 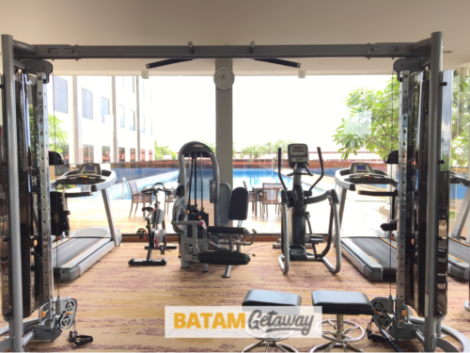 It might not be a huge gym but it has comprehensive equipment as well as an unblocked view of the pool under the bright blue sky. Exercising doesn’t get much relaxing than this. Besides the wonderful rooms, spa, and gym, my favourite part of the hotel is the Thyme Sport Bar. 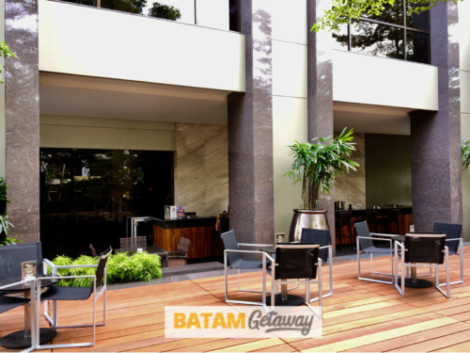 It’s basically an outdoor bar at the ground floor, right next to the main lobby. 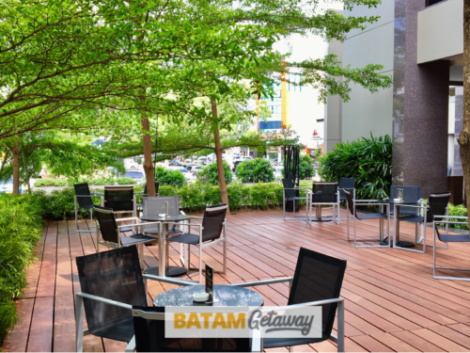 With the clever placement of plants and greenery, the whole area feels very natural, relaxing, and cooling. Even when we were there under the raging hot 1pm sun, it still felt windy and cool (just like the pictures below). Our team ended up chatting happily under the ‘hot’ sun for close to 2 hours! One other amenity that’s synonymous with I Hotel Baloi is its KTV & Club called Square. 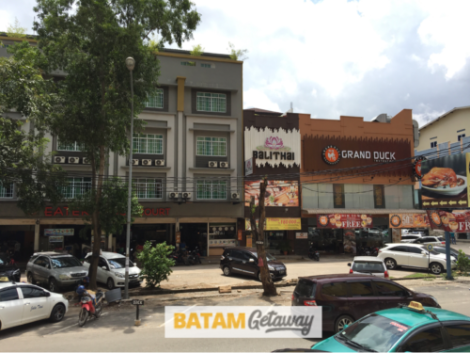 Housed in a small building attached to the hotel, it’s extremely popular with both locals and tourists. 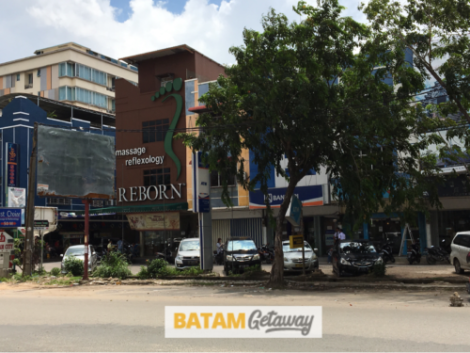 It’s one of the most happening see-and-be-seen night spots in Batam. 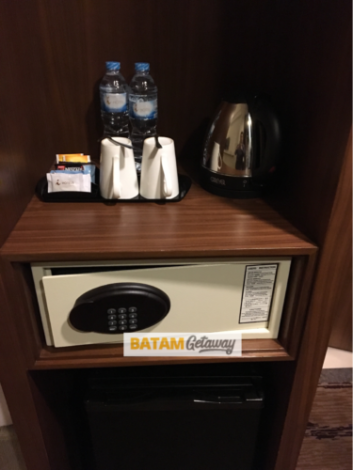 You might think that such a new, well-designed, and well-equipped hotel would cost you a bomb. But nothing could be further from the truth! 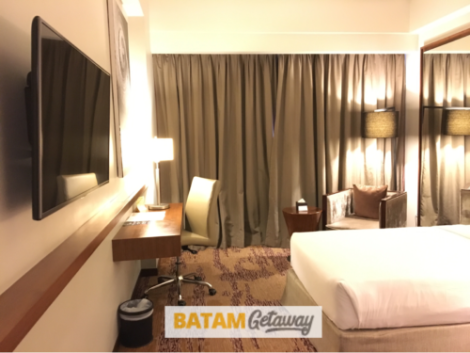 The best part of I Hotel Baloi Batam is its affordability. 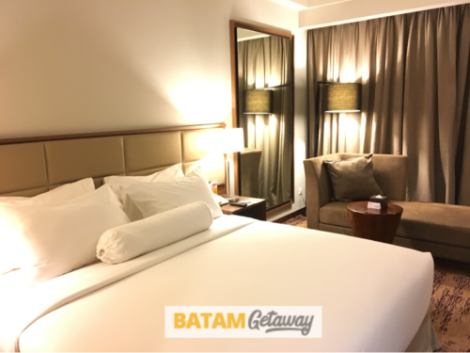 If you’re still looking for a city hotel to stay in Batam, especially in the Baloi area, look no further! 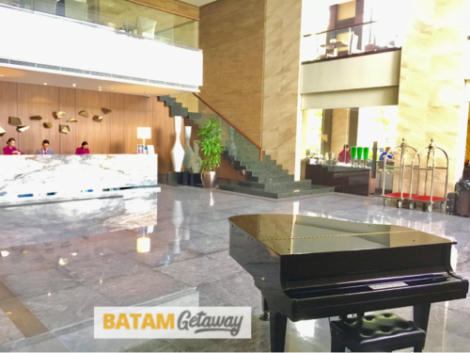 Booking this hotel is a no-brainer! 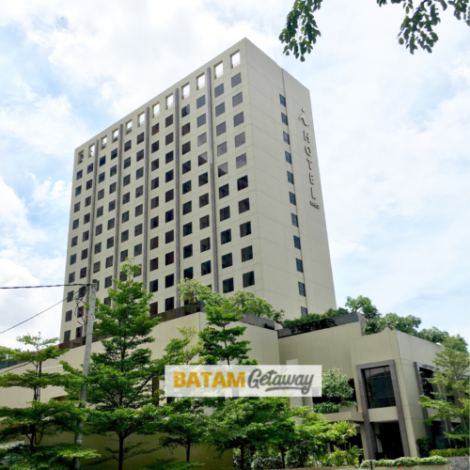 A 2D1N (2-days-1-night) I Baloi Batam hotel + ferry package is only going to cost you S$59 per person! 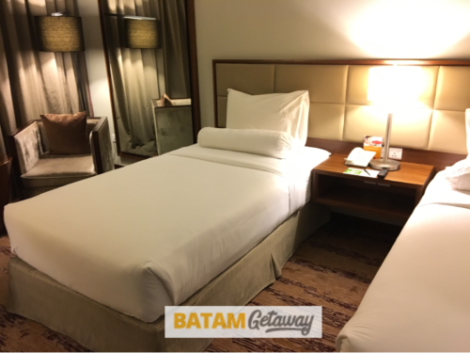 Wow, very nice review of hotel and good detail. Helped me make my decision. thank you. hope my trip will be good. Most detailed review i see. Thank you!